Just a short drive away from Puerto Armuelles, is the Punta Burica peninsula. 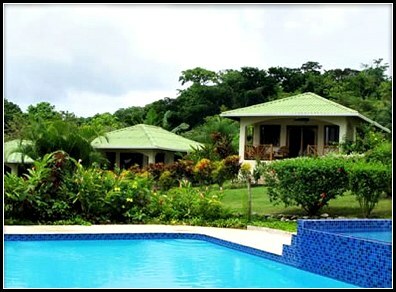 If you want to stay in a remote & beautiful location, Punta Burica is a good choice. The further out you go, the more remote it becomes. 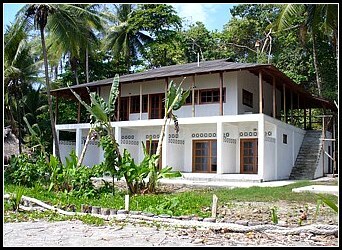 For instance, currently, only the 1st 2 lodging options below offer electricity and internet. 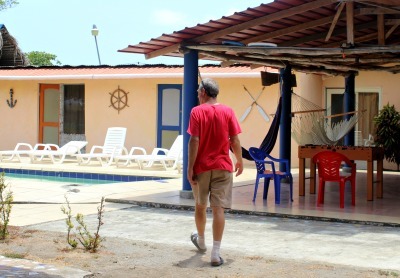 Places To Stay On Punta Burica. Entrance to the PTP. Have your Passport or Cedula ready. If you go out to one of these hotels, don’t forget your passport. 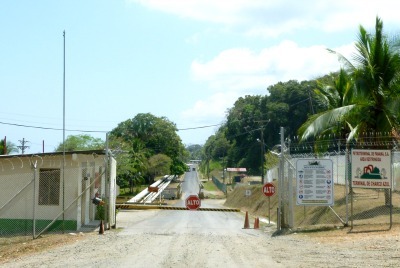 The guards at the PTP (ie., Petroterminal) will most likely ask to see it before allowing you to pass through the PTP. 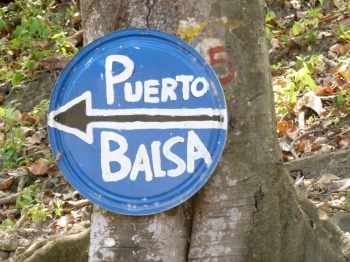 You must go thru the PTP to get out onto Punta Burica. To learn about your transportation options as well as driving directions from Puerto Armuelles out to Punta Burica, please scroll down to the description of Mono Feliz. 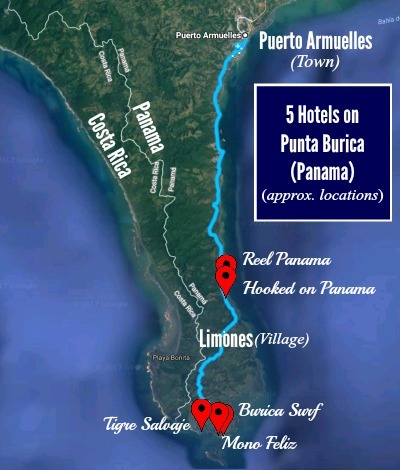 Also, 3 hotels, Burica Surf, Hooked On Panama, and Reel Panama, offer a pick up service from David, or other closer places such as Paso Canaos or Puerto Armuelles. Reel Panama is a fishing lodge/hotel. It seems like a fine beachfront place, but more basic than luxurious. Last year, we visited but did not stay the night. We did enjoy playing a few games of foosball there. We also met the owner, Joseph, and he seemed friendly. We had an enjoyable chat together. Later that same day, we did have a strange experience with the owner on our way back home. (We had gone out for the day to visit our friends at Burica Surf and Mono Feliz, see below). We were having a great time driving on the beach when our tire blew. Luckily we realized that we were by Reel Panama. We limped there. We spotted Joseph and asked to borrow a wrench and a flashlight. We had a spare but the crowbar/wrench was missing. He seemed very different from the man we talked to in the morning. Something was “off” about him. He somewhat reluctantly agreed to lend us the tools, but he never returned with them, and we never saw him again. Thankfully, his one and only neighbor was both home and very helpful. Within a half hour, we had changed our tire and were on our way home to Puerto Armuelles. We had a fun day on Punta Burica, despite our tire incident. There are 6 basic rooms. You can request a fishing expedition on Joseph’s boat. He has Grady White (Cruiser) originally built in 1995, and restored in 2015. Powered by 115HP Evinrude engine, with a maximum cruising speed of 25 knots. It can carry 4 people. 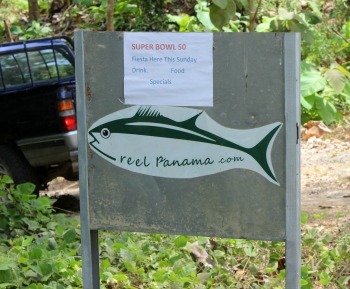 Note: Room and fishing rates and information are what appear on Reel Panama’s website. Contact them to verify cost and availability. There are 2 sites with more information on the hotel as well as the ability to book a room: Booking.com and Fishingbooker.com. At the time of this writing, each of those sites has one review each on Reel Panama. Hooked on Panama is a very pleasant place to hang out. It is comfortable and is on a beautiful beach. It is near Limones village, about 17 kilometers south of Puerto Armuelles. It takes about 30 to 50 minutes to drive from Puerto Armuelles to Hooked on Panama. It depends upon the condition of the road and how fast you drive. Fishing Charters: Available upon request. We are available to give a tour of our property. We are also happy to share our experiences and advice. We have lived and invested in the Puerto Armuelles area for the last 10 years. Go to our contact us page to set up a time, or to ask a question. Burica Surf is also on a beautiful beach. You can both paddle board and surf from this location. They rent boards for $20 a day, they also offer package deals. I write about our visit to Burica Surf, and include more details, photos, and a video. Unless you are bringing your own food, you will want to pay for meals. There are no stores nearby and the only other nearby place to eat is Mono Feliz. Keep in mind, there is no electricity or internet yet at Burica Surf. 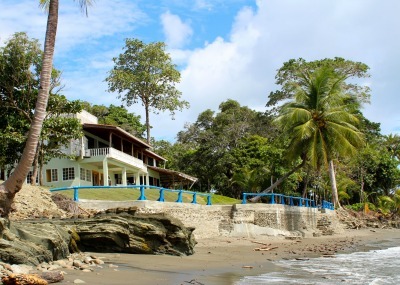 Burica Surf is the newest entry to the list of places to stay on Punta Burica. Visit their website to book your stay. We love Mono Feliz. It is simply a good place to “be”. However, it is not for everyone. It is very rustic. 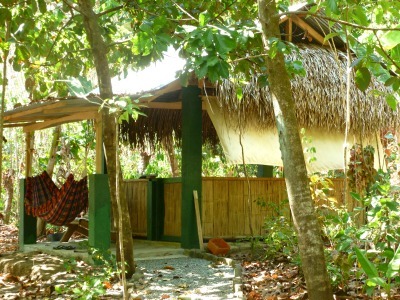 You sleep in thatched open-air sleeping accommodations (see photo). There is no internet, phone, or fans. Only the kitchen/dining area has electricity (solar powered). Wonderfully refreshing shady and spring-fed pool. There is some pretty good surf off the nearby island as well. My husband wrote about surfing on Isla Burica. John (Juancho) and Luzmila have been living here so long the monkeys have developed a habit of stopping by. They always have bananas available to feed the visiting monkeys with. 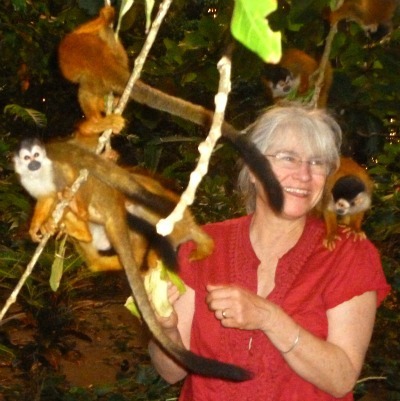 We once spent a blissful time with a rescued baby monkey at Mono Feliz. You can see a short video of that visit to Mono Feliz. A delightful and comfortable place to sleep and hang out. But you need to okay with a more outdoor living experience. Rates include swimming pool use, shower, toilet & drinking water. If you bring in your own food, you may “rent” the kitchen for $1 a meal. Don’t be shy about bringing food or drink to add to their menu. It is not an easy place to keep supplied in a variety of food options. Replies from FB can vary in speed. Calling may be a better option. 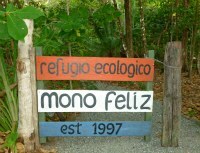 Although Mono Feliz has no cell phone service, all phone calls are relayed to Mono Feliz within 24 hours. Don’t be afraid just to show up. Mono Feliz has never turned anyone away. They will always accommodate unexpected visitors. All the hotels on Punta Burica are accessed from the route described below. The road ends at Mono Feliz. There is no road to Tigre Salviaje. You must go by foot, horse, or boat once the road end to get to Tigre Salviaje. Keep in mind, Burica Surf, Hooked on Panama and Reel Panama will pick you up in David or Puerto Armuelles, if you request it in advance. Mono Feliz is 30 km from Puerto Armuelles. How long it will take you to get to Mono Feliz depends upon what mode of transport you use. You can also take a boat to any of these 5 places. A boat ride would be much faster. You can use your own boat or arrange with a local fisherman to drop you off and pick you up. The tricky part is the pick up. You must feel confident that the fisherman will remember to pick you up. Of course, you can also take the bus back. There are bus stops in Bella Vista and Limones. We have walked from Mono Feliz to Bella Vista. It is a pleasant hike. To get a guide, someone to carry your bags, or directions, visit the store, El Mono Feliz, in Bella Vista. The store owner will provide a guide and/or person to carry your baggage. (Please tip.) Or you can simply ask for directions. There are signs to Mono Feliz along the way. Burica Surf is located about 10 minutes before Mono Feliz, on the same road. There is also a sign saying Caballos (horses) a Tigre Slavaje. Where you can get a horse and guide for the journey to there. You can take this route in a regular, non-4WD, car in dry season, but you need a 4WD car in the wet season. As one of the comments below mentions, you may also need a high clearance 4WD vehicle. Since that comment was made, the road has been greatly improved. But you never know when it will degrade again – especially in the rainy season. Go south from Puerto Armuelles to the PTP (i.e., Petroterminal) (Follow the signs to Puerto Balsa. You will see home made ‘Puerto Balsa’ signs beginning in Puerto Armuelles). You may need ID to pass through the PTP. In about 15 km you will see a fork in the road with signs for Limones and Bella Vista. There will be another fork, it has a sign for Mono Feliz, follow the sign and go straight to Mono Feliz and Bella Vista. You will go up a hill. At the top is a bus stop and a school – Escuela de Bella Vista. You have arrived in Bella Vista! Turn right (behind bus stop). It is a smooth dirt road. Turn right. You are in the home stretch to Mono Feliz & Burica Surf. About 5 minutes along this dirt road, you will see Burica Surf. 5 minutes later, at the end of the road is Mono Feliz. There is a parking lot to the right. Only take this route in a 4 wheel drive vehicle. And you must also time your trip so you are driving on the beach during low tide. 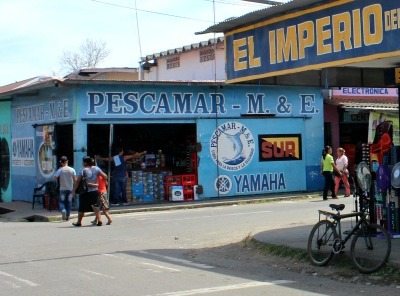 You can pick up a tide chart at Pescamar store in downtown Puerto Armuelles (see photo) or look at this online tide chart. I recommend getting a hard copy of the tide chart. You may not have access to the internet once you leave Puerto Armuelles. We love going the beach route. It is smoother, cooler, lots of birds to look at, and just plain fun! It is especially fun if you are one riding in back of the pick up truck. Dave and his wife, Vielka, own and operate Tigre Salvaje. Tigre Salvaje, like Mono Feliz, has no Internet access at the hotel. The accommodations are less rustic though. Tigre Salvaje’s primary mission is wildlife education and preservation. They welcome visitors and volunteers, but that is not their primary mission. For the first week: $35 per night including 3 meals a day. You cannot drive a car to Tigre Salvaje. The road ends at Mono Feliz. Tigre Salvaje is about a 40-minute walk from Mono Feliz. For directions to get to Mono Feliz, scroll up. Also, in Bella Vista, you may be able to get a horseback ride to Tigre Salvaje. Once you reach Bella Vista, go on the dirt road (per the directions to Mono Feliz, above), you will see a sign on the right about horses (caballos, in Spanish) to Tigre Salvaje. I did not inquire there. However, you might be able to rustle up a horse to take you and your luggage to Tigre Salvaje. Ask when you call or email them. 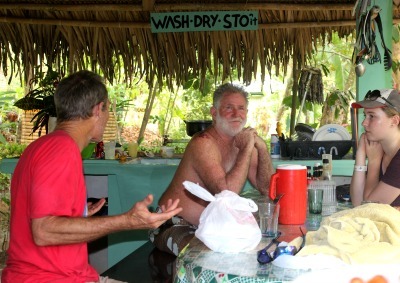 Dave at Tigre Salvaje actively tries to preserve the turtle population. He would welcome your volunteer help. The email for Mono Feliz is not [email protected] .Any idea of another address? Punta Burica esta hermoso… tuve la oportunidad de ir con unos amigos, hasta la frontera con costa rica, en donde se encuentra un hito o monumento, segun me dijeron algunos pobladores, el lugar se llama el salto y para llegar hay que atravesar una finca propiedad de los pitti. o tambien hiendo por la playa luego subir a la finca en mencion. I just returned from a trip to Punta Burrica with my family. Even with 4×4 we were unable to pass the ramp off the beach to Mono Feliz or the road route because of the road conditions. It may warrant advising readers these places (Tigre Salvaje) are not accessible during the rainy season without super high-clearance vehicle, tractor, horseback or hiking.